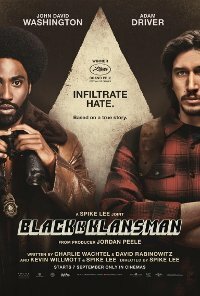 Lee’s most acclaimed and successful film since Do the Right Thing takes a look at how Ron Stallworth, an African-American police officer from Colorado, successfully managed to infiltrate the local Ku Klux Klan with the help of a fellow white office, who eventually became head of the local branch. The film narrowly avoided being banned here in South Africa. No persons under 16 (Language, Violence, Prejudice, Blasphemy, Drug abuse). It says I get a 10% discount on pizza. Language The film contains frequent strong impact language, including swearing and insults, as well as demeaning, prejudicial and blasphemous language. Violence Strong impact violence occurs infrequently, including realistic footage of violent protests and descriptions of torture. Prejudice Frequent moderate impact prejudice based on race, gender, religion and sexual orientation. Blasphemy Fairly frequent moderate impact blasphemy, with religion being used to justify prejudice. 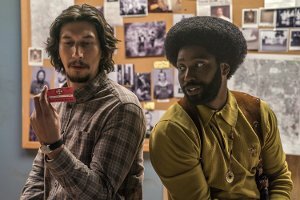 Comments The biographical crime comedy BlacKkKlansman explores themes of racism, black liberation, teamwork, love, undercover police work, religion, power, race relations and segregation, presented in a historical, educational context involving prejudice. These themes are complex and mature, with themes off racism, bigotry and hatred based on race and religion being potentially confusing, upsetting or distressing to children under 16 years, particularly give the sense of threat and menace in which it is presented. However, the material contains educational messages against prejudice and segregation by black and Jewish lobby groups, and messages of tolerance within the police department towards the end of the film, which have a mitigating impact. Themes and displays of prejudice, bigotry and racism contains elements which can be seen to advocate hatred and incitement to cause harm and depicts acts which constitute incitement, encouragement and promotion of harmful behaviour. The material is however exempted from a “Refused Classification” based on dramatic and artistic value according to the proviso in Chapter 4 Section 18 (3)(a)(ii) and (b)(ii) of the Films and Publications Act.